Over the last year there has been a strong resistance to police murder and terror across the city of Denver. This is only the most recent surge in resistance to police terror in our city, going back to the loss of Paul Childs in 2003 or more recently Marvin Booker in 2010. Denver Police have been systematically targeting and arresting those actively involved in this organizing. Denver Community Defense Committee, a group which has organized extensive support for families of people murdered by police, has five of its seven members under prosecution or known to be under investigation by the Gang Unit of DPD. Prominent independent journalists, those with an expansive reach through social media, have been targeted and arrested while filming the police in Denver. At a rally outside the statewide conference of Chiefs of Police on July 20th it was observed that DPD had a handbook with names, photos and details on local organizers or participants in demonstrations against the police. DPD has a history of this type of behavior with the “Denver Spy Files,” (http://articles.latimes.com/2002/sep/10/nation/na-spies10) where local law enforcement had kept files on those involved in social movements for decades. 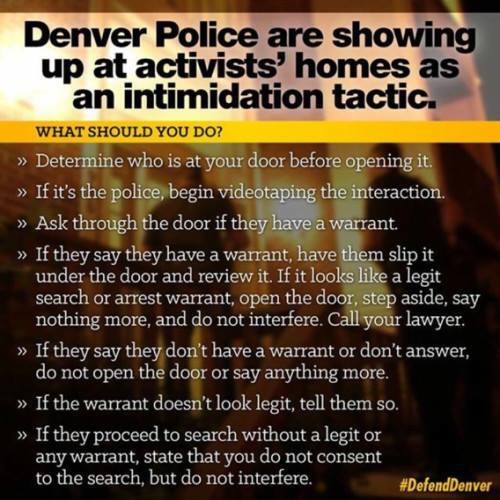 While it was found to be illegal by a federal court to compile such files on community organizers and activists, and while DPD settled with the ACLU and promised to cease politcally motivated surveillance, it appears that they have picked up the practice once again. Since Friday, August 7 at least three organizers in Denver have been visited at their residences by Denver Police officers. DPD has been asking for people by name and snooping around their homes. At least two activists have found out that police officers tried to enter their residences, without a warrant, while they were away from home. Others who have pending legal cases have had more charges added, many months later with no additional evidence, by the office of Mitch Morrissey, Denver District Attorney. It doesn’t seem to be a coincidence that after demonstrations were held in front of Morrisey’s home to protest his failure to indict killer cops, his office is maliciously adding false charges against police brutality protesters. There was also a petition to recall Morrisey as DA that garnered 20,000 signatures, a petition supported by the same protester community he is now targeting. Knowing your rights does not ensure that the police honor them. They do not care. They are legally allowed to lie to you, and will lie to you. However knowing your rights and methodically going through them might help you in your interacting with the police and might help you later if you end up having to go to court. Anything you say will be held against you. Do not answer questions. Do not talk to the police. If police come to your door, you do not have to let them into your house if they do not have a search warrant. You do not have to answer any questions. You can exercise your right to remain silent and to speak to an attorney. Videotape them from inside your home. 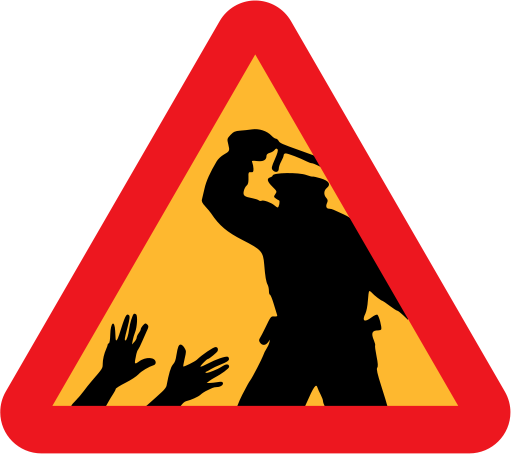 If you are stopped on the street ask if you are being detained. If the answer is no, ask if you are free to leave. If the answer is yes that you are free to leave, leave immediately. Get as far away as you can, call friends and comrades who you trust. If the police are searching your belongings or home, say out loud “I do not consent to this search.” Keep repeating “I do not consent to a search without a warrant.” It will not stop them from searching necessarily but it may impact what is admissible in court. If they do have a warrant ask to see it(they can show it through the screen or glass, or slide it under the door) verify that it has been signed by a judge. Make note of the items listed on the warrant of what they are allowed to search. If they attempt to search or take any additional items say out loud that you do not consent to items being searched that are not on the warrant. Let’s keep our heads up and hearts strong. And remember always, Mitch Morrissey’s dog is an anarchist. If you are an organizer or activist being harassed, detained or have officers come to your home let folks know at defenddnvr@gmail.com and people can be in touch as quickly as possible! Repression only makes us stronger! Haters make us love harder! This entry was posted on Wednesday, September 2nd, 2015 at 9:50 pm	and is filed under Other Articles. You can follow any responses to this entry through the RSS 2.0 feed. Responses are currently closed, but you can trackback from your own site.